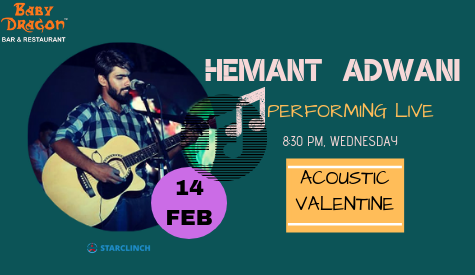 Hemant Adwani is performing live on this beautiful valentine night at Baby Dragon Bar & Restaurant, Noida on 14th Feb at 8:30 pm onwards. So, make your valentine night even more special with Hindi retro music with Hemant Adwani. Book talented singers in Delhi like Hemant Adwani only at StarClinch. Hemant Adwani is professional singer based out of New Delhi, started his career by uploading his singing videos on social media, now he has become very popular singer among Delhi. He has done numerous shows with bands and solo as well, he is the complete concert package because of his dual skills in singing and playing guitar. He has performed at campus gigs, private functions, and also playing at Delhi’s popular pubs, bars, and restaurants. His stunning voice can make anyone fall in love with his voice.